Some of you may have already found this awhile ago on my blog, but I have been waiting for Easter to repost it. This packet has been a long work in progress. Essentially, it will take you from the betrayal of Christ (after Gethsemane) through his trials, to the crufixion, and through the details of what happened while he was on the cross. It is so humbling and insightful to know these events well and to realize just what he went through those final hours. It is maddening actually. Included in this packet are questions and it is totally scripture-centered. I suggest that you take 4 sticky notes and label each one either “Matthew, Mark, Luke, or John” and put them in your scriptures so it is easier to flip back and forth as you follow the story. Also in the packet is a page of quotes that relate to what you will be studying. You will love these quotes. They are laid out in three columns so you can cut them out and put them into your scriptures if you wish. There are also things like this. 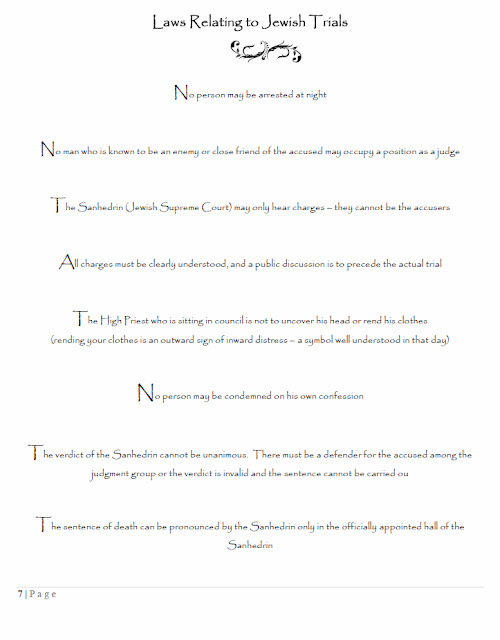 This is a page of Laws meant for Jewish trials. Wait until you see all of the laws they broke in order to get Christ sentenced! And there are pages like this. Descriptions of the people involved. The more you know about the people, positions and responsibilities, the more you will be able to uncover layers and layers of teachings and respect for Christ and how beautifully he handled the onslaught. My husband and I studied this with each other. What a wonderful experience for us. Although I had put this packet together, there was something so beautiful about us sitting down and discussing each part. I think we could do this every year, and Easter would be a perfect time. Note: In some cases, it will print better if you click on the link above and save it to your computer and THEN print it from your computer file. Thank you so much…this is amazing and I can’t wait to do this activity! Thank you so much! It looks wonderful. While I’ve been following your blog since New Year’s, I don’t think I’ve commented before. But I just want to say thanks for everything you share here. I know I’ve been blessed by it. Wow, this looks beautiful and so insightful. Thank your for all that you share, you are truly an inspiration! Thank-you so much for sharing with us. Can’t wait to get started! I thought I posted a comment last night but I guess it didnt work. Thank you for the packet, I’m looking forward to using it. I have a huge favor. I’m our ward YW personal progress leader and since we have some lessons coming up on the temple, I want to do a panel of women the girls can ask questions (how did you prepare, was it what you thought, what was the sealing like, obviously nothing sacred). I’m working on getting some questions together for the panel but….I was thinking I bet you have some great insight working with the kids all day in seminary. Would you be willing to think up some questions for my panel? I know your still not feeling well, it doesn’t have to be right away. Thanks!! Thank you so much!! I am sooo glad to hear you are doing well. And again you are amazing! I can’t wait to study this with my family! Thank you so much for sharing this (and all of your other wonderful study resources). I appreciate the time you take to do this. So glad to hear you are back on the mend…hope you are at 100% soon. Thank you for this wonderful packet…what a spiritual way to celebrate Easter and to keep Christ in our hearts, minds, and homes. Honestly? I love this! I am just ready to snuggle in with a comforter and my scriptures and your packet and just enjoy myself and the opportunity to learn more about my Savior. I’ve printed so many things off your site and can’t wait to use them this summer with my daughter for her PP. I’m glad you are doing better. Keep taking care of yourself and get well!!!!! Thank you for this packet. It is printing as I type. Thank you so much! I am so looking forward to this study. I appreciate the fact that you put in so much effort on your studies and projects. You help me stay on the path that I want to be on. This is amazing! You are so wonderful to share these things with us – even from your sickbed! I hope you are doing well and have a speedy recovery! Thank you so much for putting this together. I hope you feel better soon! Thank you, thank you so much for all of your time, talents, insights, and ideas. As young women’s president of our ward I am always looking for ways to inspire and connect with my girls spiritually. You have so many wonderful ideas on your blog. I appreciate being able to use your ideas to increase my own knowledge and understanding of the gospel. I don’t comment on blogs very much, but I wanted you to know that your ideas have touched my life and opened my mind to new ways of studying the scriptures. Obviously I don’t know you, but I feel like I do a little through reading your blog, so please know that you are in my thoughts and prayers. I hope you start feeling better soon. You have blessed many lives with your willingness to share your ideas. May the Lord bless you with a quick recovery. Got mine printed and can’t wait to get started! Thanks so much! Hope you’re resting and recovering! I’m so glad you are feeling some-what better. Take it easy and take advantage of your 5 minute naps! I printed this out right after conference and took it when I picked up my missionary from his mission. What a great way to help him transition and still study. Thank you for sharing your testimony and love with us! I rebooted my computer, and everything works dandy! Thanks so much for your wonderful study guide! Thank you so much. I have to give a lesson on Easter and I have been praying for guidence. Thank you for helping me on my quest to make my lesson great. Thank you for all of your wonderful ideas. I love my scripture journal and I am really learning alot. Glad you are getting better. Would you please send me the packet to my e-mail? Everytime I try to print it off via your site, it doesn’t print out as clean and crisp. Thanks for all you do! I LOVE YOUR SITE!!! I am sure you must hear this alot, but you are truly and answer to prayer. I have felt that I was not always “getting it” when I study. I am a visual person. I stumbled onto your site and have started my scripture journal. I have used some you your scripture study tips as I prepare my YW lessons. I cannot even express how much you insight, sharing and hard work have helped and blessed me in the short time I have been doing this. It is becoming a habit. I brought it to work with me today and a co-worker asked what I had, I showed it to her and explained it to her and she said that she had been praying for guidance to help her study the scriptures and remember them better. She said that when she saw the scripture journal she knew it was her answer. I showed her your site. Thank you, thank you, thank you for sharing your talents. Your reach is immeasurable. I just finished your packet. What a wonderful study guide! I am preparing to give a lesson about the resurrection on Sunday and this has helped me better understand what really went on. I am amazed at how many details I just didn’t know. I know the story – but mostly from watching the church videos every Easter. There is truly nothing like reading it first hand and getting answers to questions. It was amazing and I am so grateful to all your work. I didn’t want the packet to end… I just wanted to keep going on to the resurrection! Perhaps that means I should start working on a continuation to fulfill my desire! Thank you for sharing!! It is March 2012 and I don’t work with the youth anymore, but I am constantly on the lookout for good ideas to use with my Family Home Evening group (of older single adults) and also with my scripture study group, which meets once a week. We have just completed our study of the Book of Mormon and I found this wonderful study assignment here on this website to use. I am so pleased to have found it and the timing is perfect, since we will use it next week, just prior to Easter. Thanks for all you do! My daughter told me about your site and I am most grateful for it. Hi Shannon, I’d love a copy of your packet about the last week of Christ’s life. I don’t see how I can print it on your site? Can I order one from you? Let me know how I pay. Thank you! Thank you so much for these materials that have certainly helped me strengthen my testimony through the scriptures. It takes a lot of time to create and share these valuable materials. My sincere thanks! This is my first time on your site and I’m amazed and thrilled to have found it. Thank you so much. So much good information…. Thank you! I’m going to use it for my own personal study this month. I appreciate all of the work you obviously put into this. Bless you, bless you! And thanks for all your hard work so that others may learn and grow. You’re an amazing lady! Thank you so much for this and all of your downloads. They are fantastic and have added so much to my scripture study! Thanks for sharing your talents and making them free of charge! Merci beaucoup! Thank you so much, I can’t wait to read it with my husband! I cant wait to read the study on Christ’s last days, thank you. WOW! I can see how this would’ve taken a long time to put together! Thank you so much for sharing! This will be great for FHE or Easter lesson in YW! I love this packet!! I have been working on it all night, learning more and more about Christ. It is the perfect thing to dive into right before Easter. I hope you’ll be posting more packets to help your readers, and I cannot wait for Thursday for your new Scripture Journal pages. Please write more Study Packets…sell them too! I have never actually read about his part of Christ’s life on my own. Only learned about it in church. I am amazed at the wealth of knowledge I have been missing out on. I appreciate so much the effort you put into making this study guide. It helped me better understand the last precious moments of His life and my testimony grew immensely. Thank-you. thank you so much for posting. This is wonderful I can’t wait to study it all. Thank you for all the study help for those of us who did not have opportunity to take seminary. I love you study helps!! I just went through this packet step by step. It was a wonderful way to learn and study Christ’s last hours! I wept as I filled out the worksheet at the end. Thank you for your hardwork so that we may benefit! Do you have something similar for the resurrection ? I thirsted for more! Thank you so much for this packet. I just finished it this morning. I’ve been studying this series of events in seminary, but I’ve gained a much deeper knowledge through this packet than I ever would have been capable of in my personal scripture study. I’m grateful to be able to know and think about the events that were happening from tonight through Easter. It’s definitely given me more reverence toward the holiday. Thanks again for being so willing to share! You’ve touched my heart with this, and I’m sure many others can say the same. Loved this study. It taught me many new things. It was what I needed for the seson. I needed to get over my scripture hump. Thanks. Wow! You are truly and inspiration. Thank you from the depths of my heart. I am SO grateful for you! It is awesome! I will share this link! I can’t afford to buy all your stuff, and I missed the last one you shared for free! Thanks!!! I am so excited to do this and appreciate so much that you have shared this. Thank you! Thank you! What a thoughtful gift to those of us lucky enough to know about you and your talents. Thank you so much! I just started yesterday but already my testimony has grown. 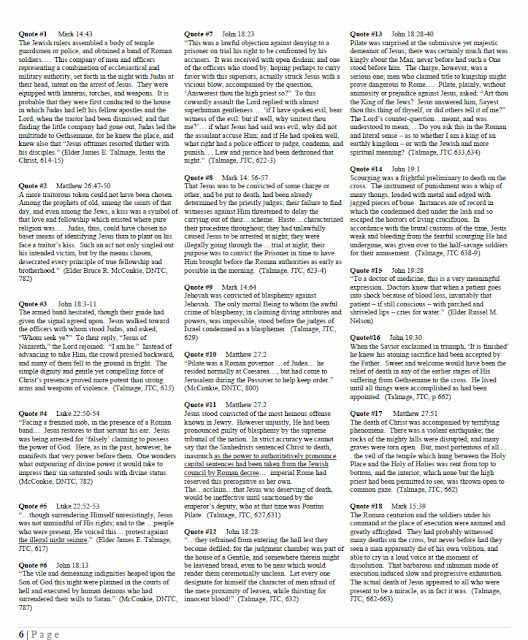 I wish I had this kind of study guide for all the scriptures! You are WONDERFUL! Thank you so much for sharing your superb talents. :-)You touch my very soul. Thank you so much for this! I’m really looking forward to using this. Like, really, more than I can put into words. From the heart, thank you! Hi, I would like to use this lesson on Sunday as a silent lesson. Do you have ideas as to how to do this? Are there handouts that go with it or a power point or a video? How exactly would I go about using it silently? Any thoughts would be greatly appreciated!! 1- Email all of the kids you are teaching and tell them that on Sunday you will be having a very special “silent” lesson. Everyone will need their scriptures and as soon as they walk through the door there will be no talking other than an opening prayer and when you give them instructions. 2- Set up a table with chairs and this study packet at each place at the table. You could decorate the table with a nice tablecloth, flowers, and some symbolic things that relate to what they are studying about. Also, tape pictures around the room of depictions of all of the things they will be studying about. 4- Have an opening prayer and then start some reverent music. I would make a specific cd for this. Reverent music needs to have NO beat – you will be amazed at how a song that is mostly slow and calm but with one small upbeat part will impact the class. It could be instrumental or with a voice – just needs to be reverent. 5- Explain to them the experience they are about to have and that there is no time to waste! They will have the majority of the class to work on this and during the last few minutes you will allow them to share some of their favorite things they have learned. As you are explaining the experience, if you have concerns that some of the kids may disrupt, explain that this isn’t just about being quiet – but rather respecting themselves and the others in the class enough to allow them to have this experience. Good luck! And Happy Easter! So….I’m using this packet this week and I have wanted to shout from the rooftops my love for the Savior! I have been telling everyone to read this packet. I have got a couple of friends doing it too and we are all amazed at how much we’ve learned about scriptures that we’ve all read many times! My testimony has seriously grown this week and I want to thank you for providing this for me. It has impacted me greatly. What an amazing spiritual experience this has been. Question…do you have any other study packets/guides like this one? With specific questions to answer to a given verse? 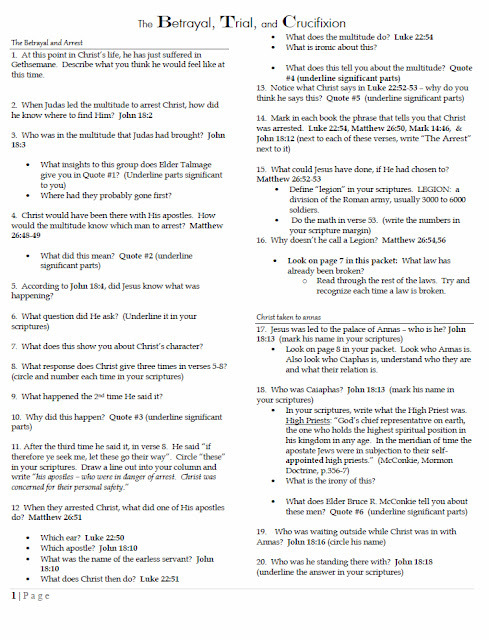 I am finding the most success with studying my scriptures with this study guide more than any other method I’ve used. I’m yearning for more! Please tell me there are more study guides somewhere similar to this or another resource to look to? Thank you so much. I can’t express enough gratitude. Such a beautiful study on Christ, not just of the last moments of his life, but of his character, purpose and love demonstrated through the atonement. I couldn’t get through this packet without several moments of great reverence for my Savior. 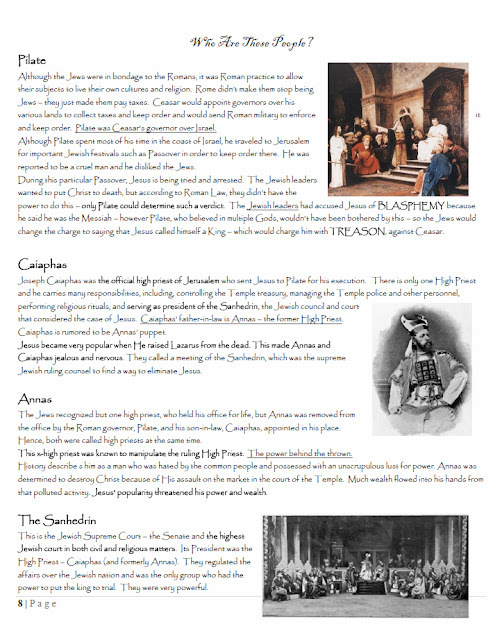 The study was rich with details into Jewish and Roman history, and I felt while going through it that I was there with the Savior through every step. Thank you! I too am yearning for more study guides like this!